5. Gina Rinehart, Australia's richest woman, earns $1 million every half hour, or $598 every second. 6. In 1892, a group of 200 Australians unhappy with the government tried to start an offshoot colony in Paraguay to be called 'New Australia'. 12. The world's oldest fossil, which is about 3.4 billion years old, was found in Australia. 14. Australia's first police force was made up of the most well-behaved convicts. 20. In 1832, 300 female convicts mooned the governor of Tasmania. It was said that in a "rare moment of collusion with the Convict women, the ladies in the Governor's party could not control their laughter." 21. 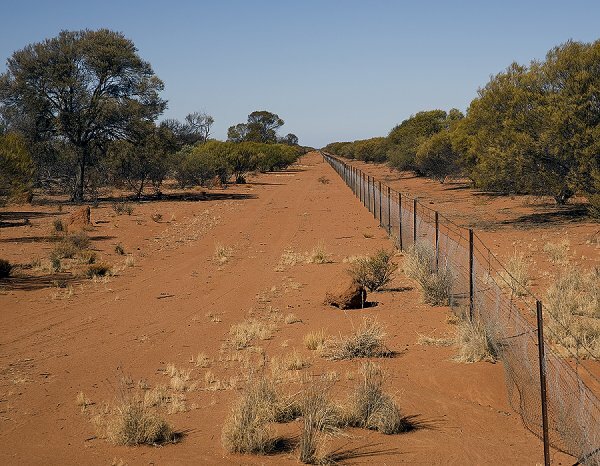 Australia is home to the longest fence in the world. It is 5,614 km long, and was originally built to keep dingoes away from fertile land. But Rabbits proved a bigger problem. 23. Melbourne is considered the sporting capital of the world, as it has more top level sport available for its citizens than anywhere else. Narrabri, NSW is Australia's sportiest town. 25. Kangaroos and emus cannot walk backward, one of the reasons that they're on the Australian coat of arms. 28. Melbourne has the world's largest Greek population outside of Athens. 29. The Great Barrier Reef is the planet's largest living structure. 30. And it has it's own postbox! 34. A retired cavalry officer, Francis De Grootstole the show when the Sydney Harbour Bridge officially opened. Just as the Premier was about to cut the ribbon, De Groot charged forward on his horse and cut it himself, with his sword. The ribbon had to be re-tied, and De Groot was carted off to a mental hospital. He was later charged for the cost of one ribbon. 37. Australia's national anthem was 'God Save The King/Queen' until 1984. 42. 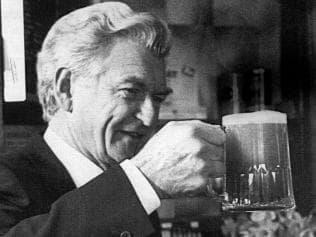 Sir John Robertson, a five-time premier of NSW in the 1800s, began every morning with half a pint of rum. He said: "None of the men who in this country have left footprints behind them have been cold water men." 48. In 2005, security guards at Canberra's Parliament House were banned from calling people 'mate'. It lasted one day. 52. The name 'Kylie' came from an Aboriginal hunting stick, similar to the boomerang. 56. Melbourne has been ranked the world's most liveable city for the past three years. 58. Australia is home to 20% of the world's poker machines. 60. Moomba, Australia's largest free festival, held in Melbourne, means 'up your bum' in many Aboriginal languages. 62. 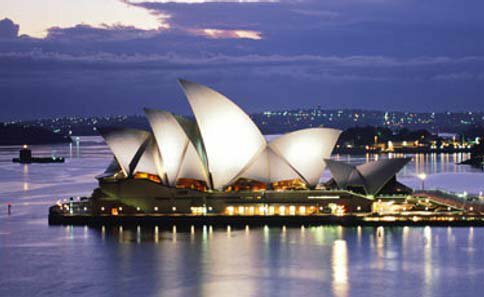 The performance by the Sydney Symphony Orchestra at the 2000 Olympics opening ceremony was actually a pre recording- of the Melbourne Symphony Orchestra. 65. Durack, Australia's biggest electorate, is larger in size than Mongolia. 66. The world's first compulsory seat belt law was put into place in Victoria in 1970. 74. A bearded Australian was removed from a darts match in the UK, after the audience started chanting 'Jesus!' at him, distracting the players. 75. There have been instances of wallabies getting high after breaking into opium crops, then running around and making what look like crop circles. 78. The male lyrebird, which is native to Australia, can mimic the calls of over 20 other birds. If that's not impressive enough, he can also perfectly imitate the sound of a camera, chainsaw and car alarm. 81. 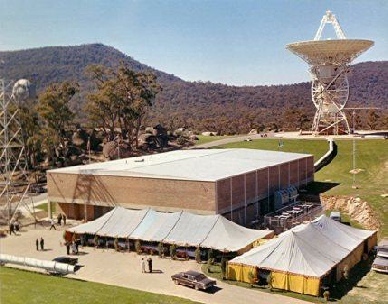 In 1979, debris from NASA's space station 'Skylab' crashed in Esperance, WA. The town then fined NASA $400 for littering. 85. An Australian election TV debate was rescheduled so it didn't conflict with the finale of reality cooking show Masterchef. 87. 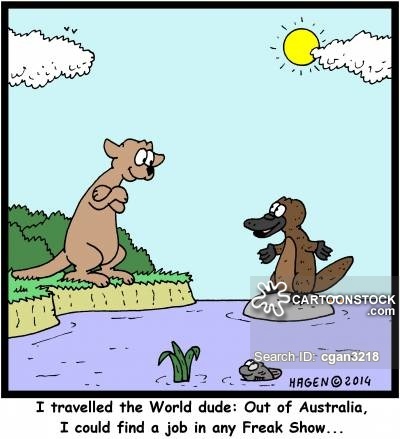 The first European to visit Australia was Dutch explorer Willem Janszoon, in 1606. 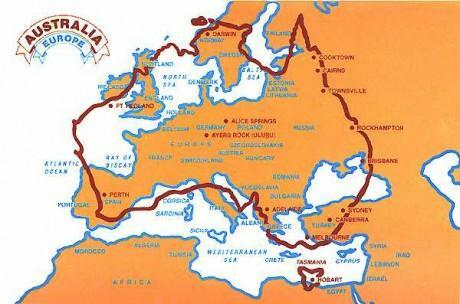 More Dutch explorers visited the country over the next hundred years, plotting maps and naming it 'New Holland'. 88. Captain James Cook first landed on Australia's east coast in 1770. In 1788, the British returned with eleven ships to establish a penal colony. Within days of The First Fleet's arrival and the raising of the British flag, two French ships arrived, just too late to claim Australia for France. This is probably why Australia is known as the lucky country! Excellent thread (I am a fellow Aussie). Also most likely has the highest price for smokes,grog and traffic fines. There are a few questionable ones in there. For example 91% of Australia is not covered in vegetation. It's not illegal to walk on the right hand side of the road and I'm dubious about the 2 aircraft colliding, becoming entangled and asking a safe landing. Last edited by Cujo; 23-02-2017 at 12:03 PM. I just searched round the net for a few photos/vids to make it a bit more interesting to read. Did take a while to find the better stuff. 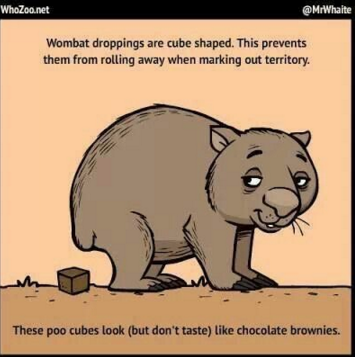 ... and I didn't know that Wombats pooed cubes ... the things you learn. Give it to me and I'll pass it on. Australia has never had a civil war. 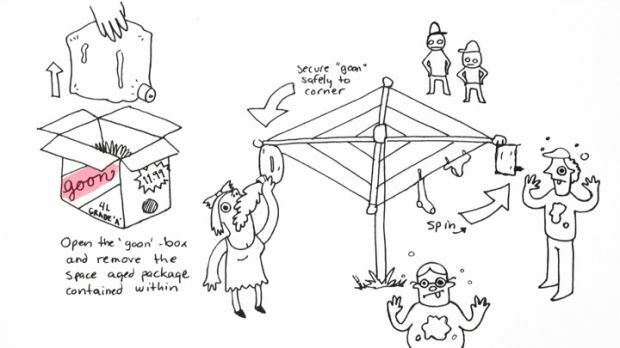 My idea anyway, I said it first. questionable .... For example 91% of Australia is not covered in vegetation. Nearly seven million square kilometres, or 91 per cent of Australia, is covered by native vegetation. Although this figure may seem high, many of Australia's desert landscapes are covered by native plants such as saltbush, albeit sparsely. Spent two years there, loved every minute. In hindsight should have stayed, was going through the settlement process...that's life. Carn't say a wrong word about the country or people. You know, we had a referendum to go republic or stay with the queen. And at the time Bill Clinton was somewhere in the middle of insisting he never had sexual relations with that woman. I thought at the time, "people are going to vote against having our own president because of what is happening in the US". But mostly the referendum failed because the weasily little prime minister we had at the time was a forelock tugging royalist, and he as good as rigged the process (he got to frame the question we voted on), and he campaigned for the 'no' vote. Another fun fact - our current prime minister was head of the republican movement at the time of the referendum. And he has recently ruled out another referendum. I think George W Bush and Donald Trump have put paid to any thoughts of getting our own head of state for a good while. There is something to be said for the non-political nature of having the queen as head of state. The flag now - oh how I would love the Brit flag to be gone from our flag. I'm dying for Scotland to leave the UK to force that issue on to the agenda. The change will come, probably not long after NZ embarrasses us by doing it first. There are more things that can kill you in Australia than anywhere else in the world. I don't care if we keep or change the flag but if it is to change I am a minimalist. Just remove the union flag and leave the stars. Otherwise the Eureka flag it has history behind it. #23 BS as well, unless you reprhase it as "Melbourne is considered the sporting capital of the world by attention-starved Melburnians...". Not exactly overflowing with world sport, just their "fumble ball" thing that is played mostly in, well, the suburbs of Melbourne. You know why they call Aussie rules "wanking" don't you? They have no international competition, they have to play with themselves. Maybe 9 out of ten for that..
did you have to quote the entire thing for a one line post ?